﻿hearing places is an online umbrella for creative projects which unite sound and place. Its published outcomes include recordings, concerts, installations, performances, exhibitions, books, courses and lectures. 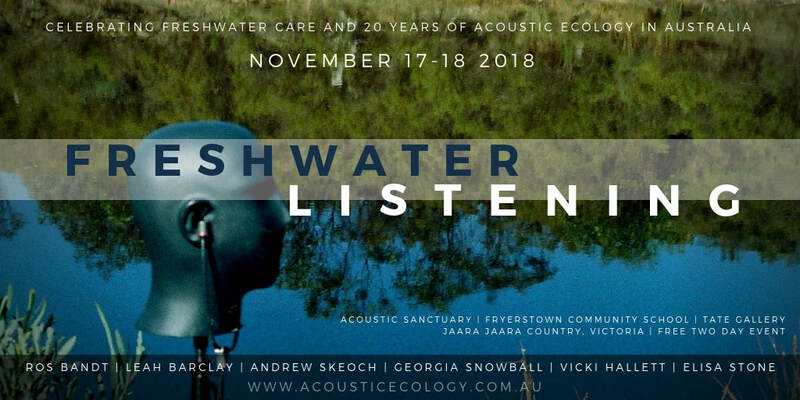 Freshwater Listening is a national two day (free) event on November 17-18 in regional Victoria celebrating freshwater care and 20 years of acoustic ecology in Australia. The event is hosted by AFAE founding member Dr Ros Bandt and the Australian Forum for Acoustic Ecology. The program includes sound walks, hydrophone workshops, freshwater listening expeditions, presentations, performances and the Freshwater Listening exhibition featuring some of Australia's leading artists. "The Tortoise and the Spider"
Wednesday November 22, 2017, 8.30 p.m. Australian Time. "The Tortoise and the Spider: a sonic metamorphosis" is an Ancient Ritual Performance : conceived and designed by Ros Bandt, created collaboratively with Made of Walking and friends at Sikelianos Amphitheatre to Parnassos, on July 20, at 10.p.m Delphi, Greece 2017. Internationally renowned Australian sound artist Ros Bandt collaborates with local artist and photographer, Konstantin Fischer, and historian Anja Zuckmantel in Hania, Crete, Greece in May 2016. They invite the people of Hania to listen to their town with fresh ears. The installation “Listening through the Walls” in the Sabbionara Gate, combines sound recordings, sonic notations, photographs and historical information, all regarding the walls of the old city – the walls themselves and the spaces inbetween. Hania is a unique acoustic, social and architectural habitat built over thousands of years.